Which Oral Irrigator Best Promotes Healthy Gums? You care, either suddenly or long term, about the health of your gums. In the former case, you may have received the unfortunate news that you have gum disease, gingivitis or need a SRP - Scaling and Root Planing Treatment.They also like to call it a 'deep cleaning'. You can shop around, but the costs will sometimes be even higher than that. Also, they don't tell you that this type of treatment may need to be repeated sometime in the next 3 years - sometimes in as little as one year. In the later case, you learned a long time ago that your gums are important and you are just interested in the best and most effective way to keep them healthy. In my opinion this is a relatively easy question to answer. So, I will tell you which irrigator I think is the best and then spend more time trying to help you understand WHY it is the best. This particular irrigator was shown to be about 50% more effective at reducing plaque and tartar buildup between regular office visits than one with the magnetic tech removed. The benefit to you is that it can help your gums by effectively giving them less work to do to stay healthy. This second researcher obtained similar results as the first one. I guess she became a 'believer' after that! Both articles were peer reviewed and published in the Journal of Clinical Periodontology - for those who want to look it up themselves. The studies appeared in the May of 1993 and April of 1998 Journal editions, respectfully. So, you have actual documented and peer reviewed results to back up my ascertation that the HydroFloss is the best. I was given the treatment offer of a 'SRP' (Scaling and Root Planing) by a dentist back in 2004 or 2005. I was not wanting it done. I tried many things like oil pulling, essential oils, and special mouthwashes - but none of that worked. Every time I went back the dentist insisted that I needed that treatment. After using the HydroFloss excessively, I went back to my dentist several months after the last bit of bad news. This time was different. She was visible surprised, perhaps even shocked - judging by the look on her face and that on the face of the hygienist as well. After a rather long look into my mouth, she proclaimed: "Whatever you are doing, keep it up. You don't need that treatment now". I've since talked to many customers who have had similar experiences with the HydroFloss oral irrigator. These are people who were worried that they were in danger of losing their teeth or spending thousands of dollars on costly treatments. I hope this helps explain why I believe the HydroFloss is the best oral irrigator around. Hopefully, you agree with me at this point. In any case, you always want to be under the care of a dental professional when dealing with any kind of dental health issue. You can bring the HydroFloss to their attention and let them check the results for you. This would be done through the measurement of periodontal pocket depths before and after 30 days of daily (the proper way) use. What Is The Best Teeth Irrigator? If you ask me, the answer (to me) is clear. The best teeth irrigator is the HydroFloss. It's patented hydromagnetic capabilities are unmatched by any other irrigator on the market. This has been proven by studies published in the Journal of Clinical Periodontology. So, if you want an effective irrigator and one that has been shown to be more effective due to it's special capabilities, again, the answer is clear. You want a HydroFloss. If you get a HydroFloss from ToothyGrinsStore.com, you will get free shipping (In America) and you will also get some other bonuses and benefits. You can read all about it here. If you have questions AND are are interested in buying from this site and this site only, you may call this number : 1-888-586-6849. If you intend to buy anywhere else, please do not use that number. My time is valuable and it is not nice (or fair) to ask me to answer questions and share my expertise only to buy somewhere else. If you have questions, I'll answer them, provided you make your purchase at ToothyGrinsStore.com - besides, the information here is something you are not likely to get from other sites. Easy: Just put your choice of extra tips in the ORDER NOTES, when you are checking out. 1. Extra package of 4 regular jet tips. 4. A package of Cannula tips (with extender included). All of the details are here. Go there now and read up. It's easy, but if you do have questions, call us at 888-586-6849. The Toilet Tree - Reviews on another site show complaints and unhappy users. (most are positive with occasional negatives. The Toilet Tree uses a rechargeable battery. I've spoken to at least one person who had two of these and he told me that the battery just does not last. The Hydro Floss - It uses a plug, no need to worry about recharging or batteries wearing out quickly. Toilet Tree - I could not find information on how much the toilet tree holds at one time, but based on pictures it does not seem likely that it holds as much as the Hydro Floss (800 ML). The Toilet Tree does not employ a magnet. The Hydro Floss does, you can read more about the power of this magnet here. Basically, the use of the magnet has been clinically demonstrating to be around twice as effective as irrigators that did not use the magnet technology. I just (now) spoke to a customer who told me of her great results with the Hydro Floss Oral Irrigator. It was recommended that she have gum surgery. But, her friendly and trusty hygienist stepped in and told her to use the Hydro Floss and the Sonicare and another mouthwash (unknown mouthwash). Then her gums were able to heal up, the pockets shrank and she no longer needed that surgery. I've heard similar stories from other Hydro Floss Oral Irrigator customers as well, and they don't always use the electric toothbrush mentioned above. 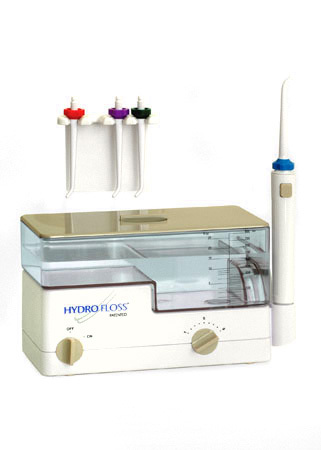 The Hydro Floss is a powerful device for dental health. Many people have gum disease, the professionals often quote the figure of about 75%. It stands to reason that many of those people do not realize they have gum disease. A single Hydro Floss can be used by an entire family of four because it comes with four color coded jet tips. If you have more family members, you can just add more tips! Protection and Prevention CAN save teeth and can also save money! Now, you can get the Hydro Floss, Model Number 7618.034 and the Pocket Pal Jet Tips together, in one package. Many people like the pocket pals because they can be used in a special way that the regular jet tips (that come with the Hydro Floss cannot). The pocket pals come with separate directions so there is no need to worry about figuring out how to use them differently. You can see this bundled package here. We do have the Hydro Floss 2013 Model Oral Irrigator, you can check it out here. This is, in my opinion, the best oral irrigator. If you understand the benefits of oral irrigation, this HydroFloss New Generation Oral Irrigator takes it to the next level. This is because of the magnetic technology it utilizes. Other irrigators don't have this benefit. This is what allows the Hydro Floss to stand out, head and shoulders, above the rest. It has been clinically shown that an irrigator without this magnetic technology is NOT as effective as the Hydro Floss with the magnetic technology. So, don't miss out, get your Hydro Floss Oral Irrigator, New Generation, today. Of course, as biased as it may sound, we think that ToothyGrinsStore.com is the best place to buy a Hydro Floss. You can check out our current offer here. If you buy your Hydro Floss at ToothyGrinsStore.com, you can ask to get a bonus package of your choice of pocket pal tips, regular jet tips, or cannula tips - but this must be requested at the time of purchase and cannot be requested afterwards. In addition, you can request bonus digital (downloadable) copies of the books: What You Should Know About Gum Disease and How To Stop Gum Disease in 4 Easy Steps. This must also be done at the time of purchase. In addition, you can have a bonus telephone consultation about how to get the most out your Hydro Floss as well as what you can do to make it last longer. Read More About The Hydro Floss Here. The Sonicare and the Hydro Floss Oral Irrigator are two separate products. One is an electric toothbrush and the other is an oral irrigator. Of the two, the one I use is The Hydro Floss. If you want to know why, you can read more here. The reason I bring this up is because some people have confused the two. So, I hope that I have cleared that up for you. The magnetic quality is that a charge is placed on minerals that are in the water. This charge, in turn, causes plaque and bacteria to become less adhesive and come off the teeth and gums easier. This causes a greater reduction in plaque and tartar buildup between office visits as shown in two articles published in the Journal of Clinical Periodontology. One article was published in May of 1993 and another in April of 1998. The second study was done with the intention of disproving the first researchers results. However, the second researcher obtained even better results than the first researcher, making her a 'believer'. So, it has been clearly documented that the magnetic quality is a big deal and makes a significant difference. If it is time to improve / protect your dental health or that of someone you love, then maybe it is time to get a Hydro Floss? Looking for a replacement for your model number 7618.034 HydroFloss Oral Irrigator? You can get that model number here. Do you need parts for your model number 7618.034 HydroFloss? If you are fairly handy, you can also replace the hose assembly in case that is the problem you are currently having. You will also find the correct replacement reservoir, plug (for the reservoir) , jet tips and o-ring (for the reservoir) here under parts - for this model number. 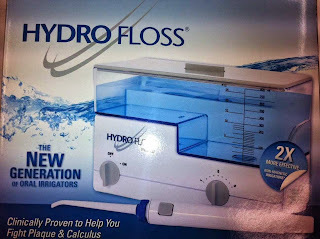 If you are not sure what model HydroFloss you have, it is stamped on the bottom. The 7618.034 is the one that we currently stock. If you have additional questions, don't hesitate to call 888-586-6849. Find Your model 7618.034 Hydro Floss Oral Irrigator here. Is There Hope For Those Who Aren't Flossing Enough? You better floss more! we are going to talk about how to use your HydroFloss. Not just how to use it, but how to use it properly. I think a lot of people don't know this and they certainly don't teach others how to do it, unfortunately. But I'm going to tell you how here. Of course, you are going to have some questions. Actually, you should have questions. 888-586-6849, I'm available personally. I can talk to you and help answer your questions about this machine and how to use it effectively. Not only just how to use it but how to measure or guage your results utilizing the services of your dentist or hygienist. There are isa very objective way for you to know if you are making improvement or not. So, let's get started. The proper use of the HydroFloss is to use the HydroFloss - 2 reservoirs, twice per day. That's 4 total reservoirs per day. That would be 2 in the morning and 2 in the evening. This is perhaps the best way to do it. This is a reservoir. This part where you see the water. That's a reservoir. So you fill that up to the top. Use it once. Fill it up again,the second time, that's your morning treatment. Use it in the evening. Use it twice in the evening. So fill up one reservoir and then use it and fill up another one and use it and that is your evening treatment. These tips are all exactly the same. There are different colors so that different members of the family can all benefit from using the HydroFloss. This is a powerful machine. If you use it the way I described, you may see much greater results than you would otherwise see by not knowing what I just told you. It\s very important. That is how to use the HydroFloss properly. That's the best practice as determined by the manufacturer. And it does seem to produce the best results for the most people. Often times when I occasionally here from someone who doesn't get good resuts, I ask them, "Are you using two reservoirs, twice per day" And almost always, almost every single time except one, the person has said no, that they were not using it properly. So, when you use it the way I just described, you increase or improve your chances of seeing benefits and results from using this machine which is really the best oral irrigator out there bar none! There is a very special reason for that. And again, if you have questions, you can call me at the number at the top of your screen. I will also say that you always want to be under the care of your periodontist or dentist. They can help you and I can tell you how they can measure your results and how you can monitor your results and see if you are actually making improvement or not. Unfortunately, as one dentist said, "many people are headed for gum surgery and they don't know it". The sad fact of the matter is that about 75% of people have some gum disease right now. That's what the dental professionals tell us. Seventy-five percent, that's 3 out of every 4 people. As that condition progresses without doing anything about it, that's when real damage occurs to the tissue that supports your teeth. So, you definitely want to keep your peirodontal health under control. It's very important. You can work with your periodontist and your hygienist or your regular dentist to make that happen. This can be a very important piece of that puzzle for you. Again, this is Dave with ToothyGrinsStore.com. I hope that this video was helpful to you. I hope that you will like this video, share it with others so that others can find it and gain this important information as well. Again this is Dave with ToothyGrinsStore.com. Give me a call at the number at the top of your screen. You should have questions and I will be happy to answer them for you. If I am not there, leave a message and I can always call you back. Again, this is Dave with ToothyGrinsStore.com thanks for watching. Please subscribe to this channel and like this video. Have a great day. Remember to subscribe to this channel. 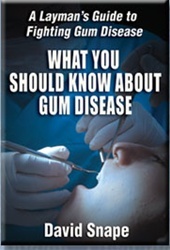 Get the e-book How To Stop Gum Disease In 4 Easy Steps at no cost.